Edited by dean2424, 15 October 2011 - 08:44 AM. Let me guess - someone has offered to swap you the Pet Aliens you need for a Bad Eggz Bunch figure? All 4 commanders for Â£120 bad eggz bunch? hmmm You need to play your cards closer to your chest mate. I have seen massive lots of pet aliens go for not that much which included the mother ship commanders and other shizz. Keep calm, you have all the time in the world. But if you do go for it, good luck with the deal. going to be putting a yellow eggosaurus up for sale soon, will keep you posted. Edited by dean2424, 17 October 2011 - 12:11 PM. Buyers beware: eBay user adamcraig123 who is selling a Bad Eggz Bunch figure on eBay is using a shill account to inflate prices of his auctions. The shill account is leeloos91. Think twice before buying anything from this seller. So it was he who won the poacher figure and just relisted it. He wont get Â£67 for it thats for sure though, might as well list it at 99p again.. I figured this was hat was happening...its his 3rd relist!! Was thinking about accepting an offer he made me for Â£50, but won't be doing that anytime soon. Hi there, my name is Angela! I'm new to this forum (first post)...I came over here from the October Toys forum which I also just joined. I made some friends over there and they nudged me this way, lol. I'm a long time collector of little figures, and also an artist (I have been sculpting for years and will be submitting a couple designs to OMFG) . I have tons of M.U.S.C.L.E., MIMP, Battles Beasts..and just got into OMFGs. Is there an introduction thread here or am I okay to just jump in? I don't wanna annoy people. I just discovered BEB online too...but I don't own any. All I know is they're from England and they're expensive, lol. Can anyone direct me to where I could find some hard plastic ones? I don't want to collect any rubber figures that will break down..so I'm sticking to PVC or plastic/resin stuff. As a kid I had no idea MIMP would get kinda worn down . Is anyone on here still selling an BEBy? I'm not sure what ONE figure even goes for...but I'd be super happy if I could even get my hands on a couple . The sculpts look pretty cool! Hey Angela welcome to LRG. Feel free to jump in anywhere though it's always better to keep specific toy discussions in the proper forums. 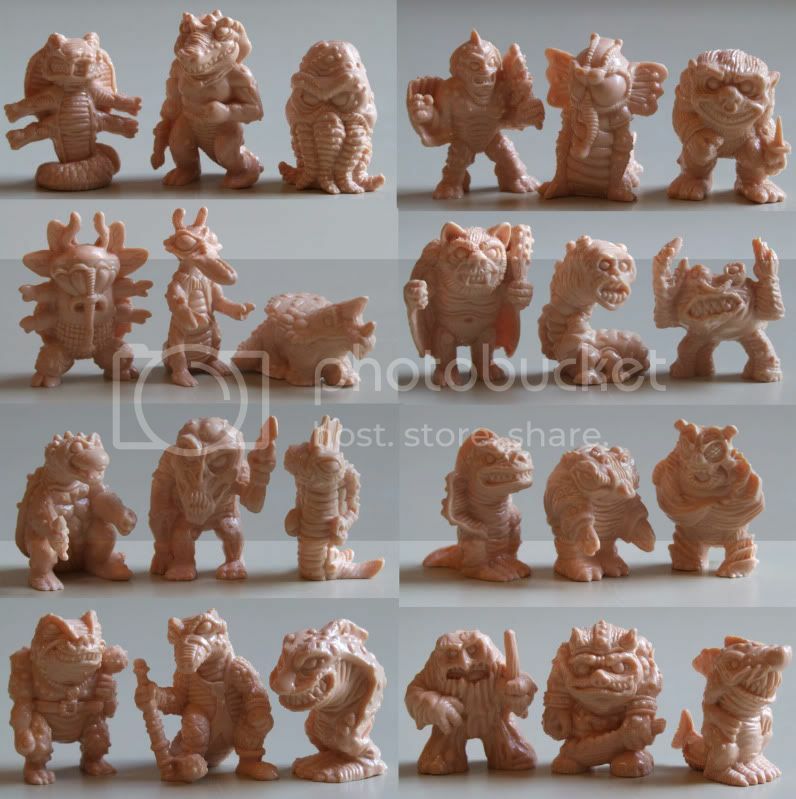 BEB figures are unique among most old rubber figures in that there are basically two kinds and the softer ones do often breakdown then harden and deform over time. No idea what causes it though. Doesn't really happen to any other lines that i know about. A few toy lines with clear figures do end up cloudy eventually but stuff like mimps and muscles and weirdballs all hold up just fine if you don' leave them to bake in the sun. As far as finding them your best bet is posting a Want Ad here and searching ebay regularly. The prices are rather insane unless you get really lucky and find them hidden in lots of other toys on ebay. Another option would be seeking out a few of the reproduction versions a member here produced years ago. Yes they are copies but for collectors not willing or able to shell out big bucks they were a great alternative. Here's a pic of the reproduction set. I never saw the repro versions before but they are gorgeous. The detail is really evident in that flesh color. They came out here before my time but i managed to contact the maker and snag my two favorites. They are great. Hard shiny resin so they can't be confused as the real thing. Hi Guys, I just listed one of these rare guys Green Omletto on eBay just now. I also listed some other Monster In my pocket and will be listing more this week. Some dinosaur ones etc. Nice, ill keep my eyes on him. Hi everyone, hopefully some time within the next week (i.e. when my new digital camera arrives), I will put 12 Bad Eggz Bunch figures on eBay. All are hard plastic and in good condition. I am based in Southport, UK, but I will ship abroad. EDIT: They're now up and ready to be bid on! Edited by PsychoSavager, 14 September 2013 - 07:04 AM. That was the one you outbid me on. Looks great! I found this one in a mixed lot of mimp. Did you bid on that lot? The stand out figures for me were the yellow BEB Egg Poacher, The pearl green Yolanda Psycho Toxic Crusaders mini, and the two Ganesha mimp. Edited by Jackson, 17 November 2013 - 08:27 PM. Was the above lot won on eBay.com? I don't remember seeing it pop up on eBay UK. It would be difficult for you to outbid me if I hadn't bid on it, wouldn't it.